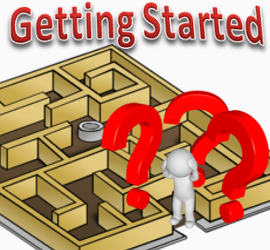 Getting started - Brigitte Belsky ~Helping You Create Your Laptop Lifestyle! Getting started can feel so overwhelming! You have a sketchy idea of what you want to accomplish and a desire to bring it to fruition. But you feel you have little to no experience in anything to do with this online biz thing. More pressure if you feel like a techie dinosaur. Yet you know it can be done because others are doing it! Online research may give you the impression that there are secrets! Why? Because it’s a marketing strategy that some will use in order to gain customers and sell them a concept which only gives part of what you need to figure this online biz thing. In reality there are no secrets, there’s simply a process. A process anyone can learn, apply and succeed. Whether you know what you want to accomplish or not, or how to do it, start the ‘learn & apply’ process. As you go along, your ideas will fine tune and it will all make sense quicker than you think! You will be all the wiser and gained skill sets that will erase any doubt you may have about your own ability. In order to do this you need a one stop source that will give you an A-Z roadmap with newbies in mind & no coding required. My best find and #1 recommendation is the Wealthy Affiliate University. Wealthy Affiliate University really is a wealth of practical information and is delivered in text and video format. Another priceless bonus is having the support of a community of like minded people of varying levels of experience, being able to brainstorm ideas & theories with. 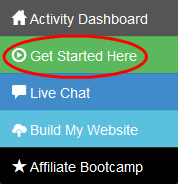 Once inside the Wealthy Affiliate University the best place to start is at the ‘Get Started Here’ . The simple step by step lessons for building your online business from scratch, with ‘To do’ actions which you can tick off. There are only 2 levels of membership, so no danger of having upsell after upsell. The first is the Starter Membership and is totally free, no credit card required. It gives limited access but more than enough to have you see your online biz launched. Plus for your first 7 days you’ll have access to some of the Premium features. The second is the Premium Membership which is only $49 per month which unlocks everything WA has to offer. Greater savings can be had with the yearly membership. At no time are you required to upgrade to Premium Membership. You can remain a free member for as long as you want. You have aspirations. You have passions. You also have so much value to offer, whether you realise it or not. Tap into them and share them with the world. Learn, Apply, Earn, Succeed! With the free membership you can dig into the available training straight away.